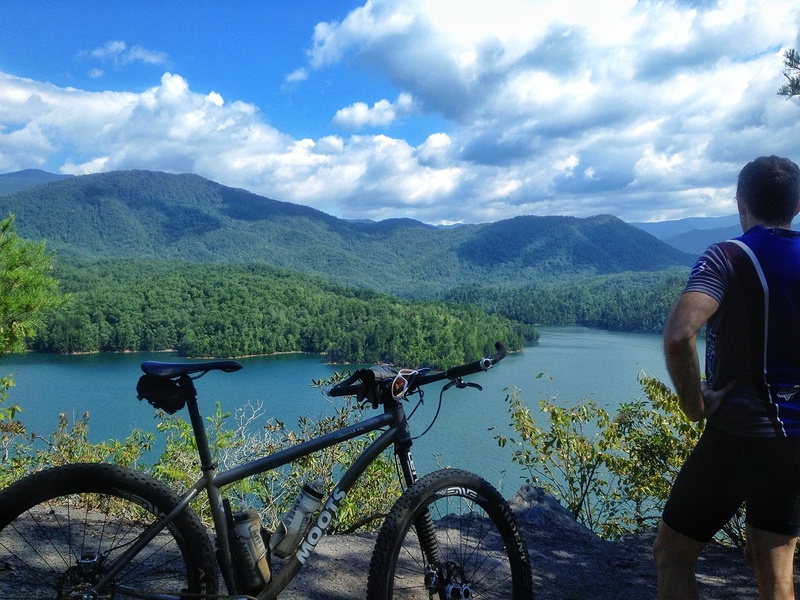 Last week, I took a couple days off and drove up to North Carolina to go camping and mountain biking with a group of friends. I’ve made this trip a few times over the years and each time it’s been a terrific way to unplug. 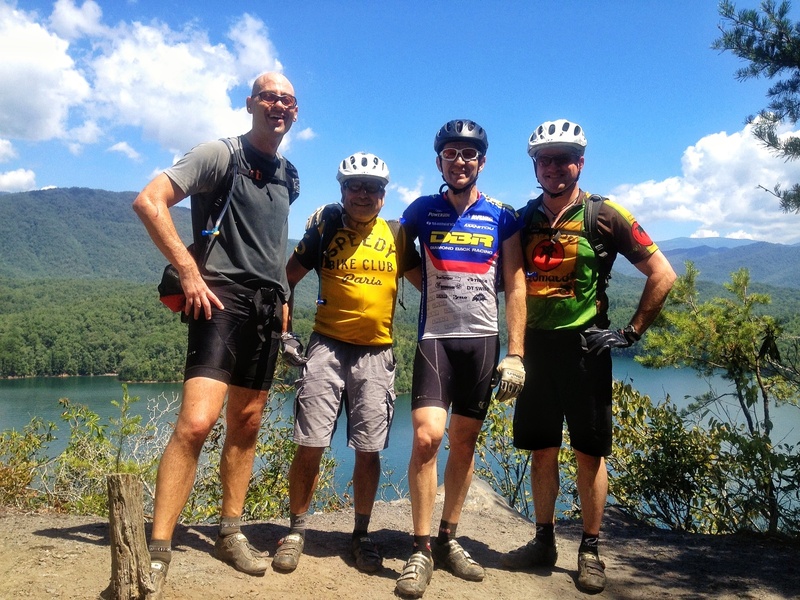 I can always count on minimal cell coverage and tired legs along with great times with friends. This year I reflected on a few things I already knew. In no particular order, here they are. Thanks to those who were in the pictures and who questioned me, reminded me of a few things, and insulted me. Getting to the top takes a lot of work. 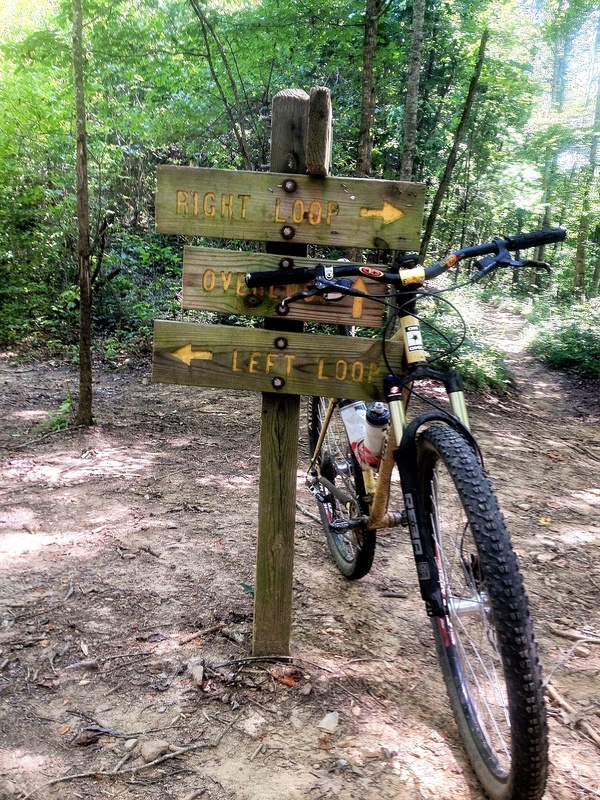 Any time the word “overlook” appears in a trail name, you can be assured that there’s a climb involved. The same can be said of many goals in life. We rode four days and each day there was at least one serious climb involved. None resembled an off road Tour de France. Many were in the heat and over some rocky terrain. A couple of the climbs had other options like you see above. As the weekend went on, people resisted the idea of going to the overlook a little bit more. We all did it though and we rode as a group. The result and group satisfaction made it worth the effort each and every time. I wanted to take a bike on the trip which I hadn’t ridden in a couple months because it needed some work. Prior to the drive up, I took my bike to a local shop to get a bit of maintenance done that I wasn’t up to. That way, it would be ready. Or not. As prepared as I’d hoped to be, I had a couple things go wrong. 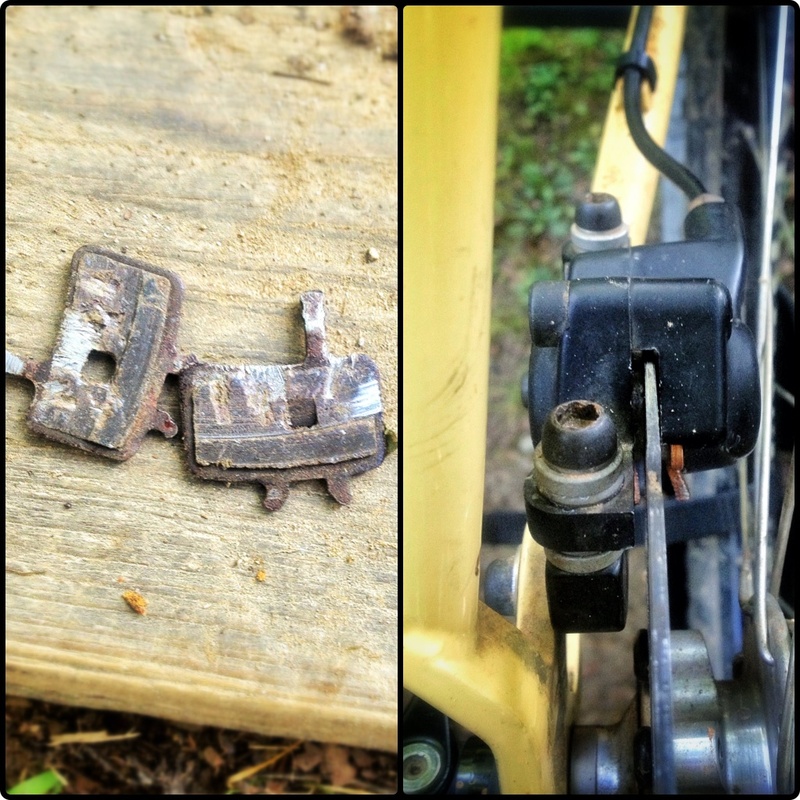 The first was a wheel which slipped on my first ride and caused my rear brake pads to wear out (see above). I was prepared enough to have a spare set but we couldn’t get them on totally right. I was prepared to grind out the next day and let them just wear in with a lot more effort. That worked for about 2/3 of the ride when I had a crank arm come off. At that point, I had to soft pedal the bike home and push up a couple climbs just to make sure I made it to the end. The moral of this story is to prepare, work through adversity, and be ready to change your approach. Oh, and it always helps to bring along people with different or better skills than you have. It’s even better if they are fun to hang out with. 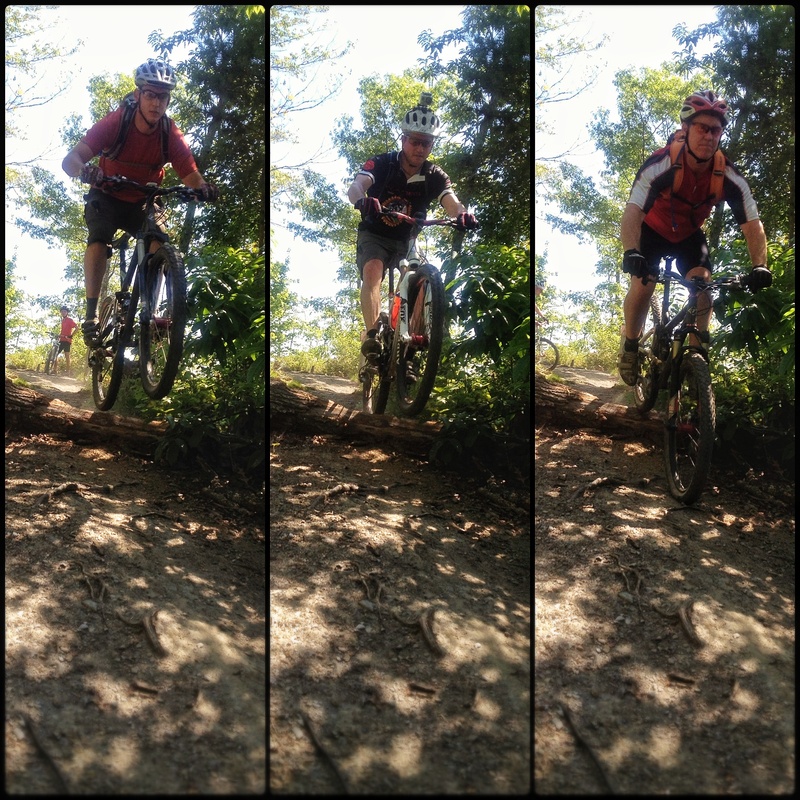 Here are three riders going over the same log at the start of a downhill. This is the payoff right after one of those overlooks, actually. While you may know nothing about biking or the types of bikes my friends are on, you may notice their positions and the front wheels. The rider on the left has completely lifted off and caught air. The one in the middle has the front up but isn’t going as far out as the first guy. The third one is being conservative and rolled over the log then went on down the trail. Each one of them knows there’s another 10+ miles to ride that day and that there’s another day yet to come. They know their limitations and are doing what they love without taking risks beyond the situation. Actually, the one in the middle is getting married next weekend and was under specific instructions not to damage himself for the pictures. 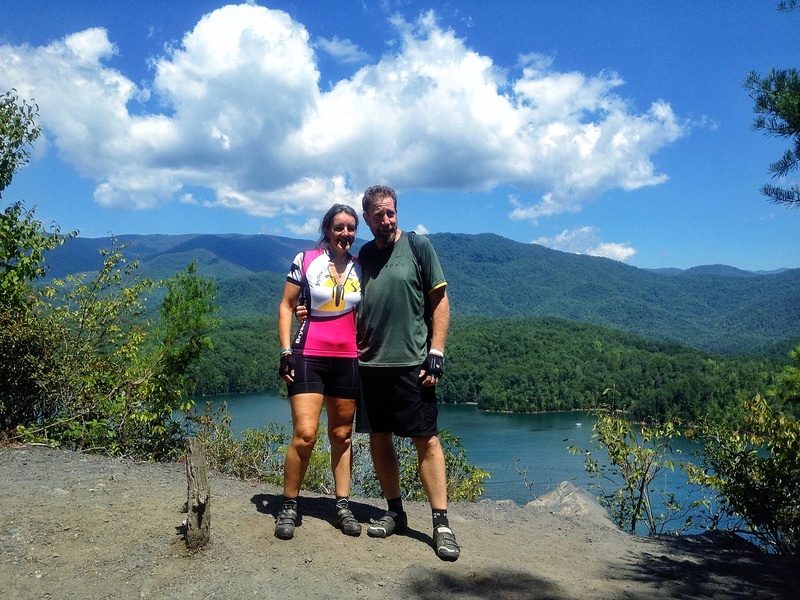 This is Tim and Helen from Gainesville, Florida. We bumped into them everywhere. On the trail. At the bike shop in town. Even at the campground as we were heading out. We had never met them before. At the first break on the first ride we met up at a scenic area and there was just something that made the group of us get along. Each time we met, the smiles seemed to get bigger and we were all happy to take a quick rest and talk some. Just taking the time to interact added quite a bit to everyone“s experience. You never know, that stranger you meet could end up being a friend. Of course, the same can be said for each person on our weekend. I’ve known one friend for over a decade, a few for many years, and one just for a year. Each person makes my life a little bit better and added to our group dynamic. Keep some of this in mind and enjoy those experiences. And remember, the first word in “Stop and smell the roses” is STOP. Otherwise, you may cut your arm on a massive tree branch.